Here at On the Water in Maine ® Inc., we rent waterfront or water-view vacation properties (except in the villages of Camden, Rockport, and Boothbay- near our offices, where we offer some in-town properties), primarily in the summer between June and October, on a Saturday to Saturday or Friday to Friday weekly basis. On the Water in Maine ® or our affiliate companies, Camden Vacation Rentals Inc. and Boothbay Vacation Rentals Inc. are accurate and guaranteed certification of a rental property by a 3rd party. By renting through an agency, guests can trust that they are getting a property as it was advertised. It is important that you know that we have a contractual relationship and serve as representatives for all our Property Owners. We treat all parties (Property Owners and Guests) honestly, fairly, and in good faith. Below are the company policies that have successfully been in place since 2006. We appreciate all of our guests adhering the to the following guidelines and policies. We believe the guidelines and policies for renting with us are generally the same as many other vacation rental companies across the hospitality industry. With one or two minor exceptions, as you review them, we think you'll find they are all common-sense guidelines. Please let us know if we can clarify any of our policies to you. A SPECIAL REQUEST AFTER YOU ARRIVE AT YOUR RENTAL PROPERTY - We'd rather hear about any concerns or problems you may encounter during your vacation as soon as possible. Telling us after your stay, when we are no longer able to address the issues, doesn't provide us a fair opportunity to exceed your expectations. No problem is too small. Call us 24/7. Your vacation experience is important to us and if we can fix something to make it better, we will. The occupancy of each house is specified in the property listing descriptions and in each Rental Agreement. This number is the maximum total overnight occupancy. Children are counted in total occupancy. As Dr. Seuss wrote, "A person's a person, no matter how small". Over-occupancy of a property will cause an expedited eviction. There are too many reasons to list here why this is so important, but don't hesitate to ask. Regardless of whether the house you renting allows 4 people or 6 people, we like to know how many people will be occupying it with you. You are welcome to have up to 1.5 times the occupancy of the property come visit you for dinner, drinks, etc. So - a 6 person maximum occupancy home would be welcome to have 3 visitors. To exceed that number would turn the rental into an "event". Our Property Owners are looking to host people that want to come have relaxing vacation experiences in their homes - not large family gatherings, weddings, reunions, etc. Your reservation confirmation e-mail should accurately reflect the exact number of adults and children staying in the Property. If you are unsure, please let us know so we can note your reservation. Talk to us in advance of booking. Both On the Water in Maine and the Property Owners we work with are reasonable people. We'd rather hear in advance that "maybe" 2 additional adults will stay with you two nights, then that don't come at all. Basically - as you can imagine, we don't like surprises. Many vacationers like to vacation with other family members or friends. Although only one member of each rental party will sign the Rental Agreement, we like to ensure that the Guest who signs the rental agreement in their name is solely responsible for payment, deposits (including fees and taxes) and maintaining the condition of the property. We ask that all Guests please read the Rental Agreement carefully before signing it. On the Water in Maine Inc. rents to family groups on vacation only. We ask that the renting Guest must be at least 25 years of age. Identification and proof of age should be provided upon request. We sometimes advertise our properties on other websites, such as AirBnb or HomeAway. Despite this, the listing for each property we offer for rent as advertised on our website at www.onthewaterinmaine.com is the "master" advertising listing for each property we offer rent. Because we don't always update information on affiliate listing webpages timely, Guests should always review the master listing on our site for the most up-to-date information about a property. We will always honor any advertising listed on our website, but not on others. While we look out for the interest of our Guests when it comes to rentals - we must also pay special attention to our Property Owners, who are also our Customers. Many of our Property Owners count on the income generated by renting their vacation properties, and when a week is canceled, they must contend with lost revenue and the possibility of the unexpected situation of a property not re-renting for the week they had intended to see rented by a Guest. Maine has a short rental season, and every penny of revenue counts towards paying property taxes, maintenance, and upkeep for the properties we offer for rent. Once a reservation is confirmed (i.e. rental agreement signed) any cancellations, changes of dates or switching of properties will invoke the cancellation policy. So, be sure when you proceed with initiating a rental transaction for us, you are committed to the rental. All cancellations by GUEST must be made in writing and received and acknowledged by OWM on behalf of OWNER. If GUEST cancels this Rental Agreement after it has been signed by GUEST and returned to OWM, there is a cancellation fee of 100% of the Grand Total (including taxes and Processing Fee) which amount shall be reduced only in the event that OWM is able to re-rent the Property for the Rental Term (hereinafter referred to as a “Re-Rental”). For a Re-Rental of the same amount of Rent as set forth in this Rental Agreement, all amounts paid by GUEST shall be refunded to GUEST less a cancellation fee of 10% of the Rent, and 100% of the Processing Fee which will be retained by OWM. For a Re-Rental for an amount of rent less than the Rent, all amounts paid by GUEST shall be returned to GUEST less the difference between the Rent and the Rent for the Re-Rental, a cancellation fee of 10% of the Rent, and 100% of the Processing Fee. (If GUEST initiates a Cancellation before the final balance is paid, they are still obligated to continue paying the final payment on the due date.) Any refund to GUEST will not be made until after the Check In Time for the Re-Rental and all amounts for the Re-Rental have been paid. This cancellation policy is strictly adhered to so GUEST is encouraged to consider purchasing travel insurance that will cover GUEST in certain situations as set forth in the policy should GUEST need to cancel this Rental Agreement. There are many independent insurance providers available that GUEST may search for on the Internet using for example “Vacation Insurance” as a search term. Travel insurance also allows you to obtain coverage for the cost of additional items such as boat rentals and travel expenses if you desire. If the OWNER must cancel this rental agreement, the OWNER will do so in writing and will provide a full refund to the GUEST within 7 days of the cancellation through OWM. Once cancelled in writing, GUEST cannot take their rental week back without a new written notice to OWM and only if the Property is still shown as available on the calendar for the Property on it’s listing page. GUEST is not allowed to sublet their week(s) to another party without first contacting OWM for approval. OWNER reserves the right to reject any sublet rental. While we don't offer it, you can purchase Travel Insurance to cover your vacation to Maine. There are many good companies out there offering it. Two years ago one of our Guest purchased a policy through Allianz and raved to us about that experience when they had to make a claim. Red Sky is popular as well. Most seem to charge around 6% of the total rental amount for basic coverage. There are "any reason" policies out there that go as high at 12% that cover you for any reason you want to cancel. You can add anything you want, such as boat and bike rentals, airline tickets, etc. Your rental home will be stocked with a 'starter' supply of products including 2 rolls of toilet paper in each bathroom, 1 roll of paper towels at the kitchen sink, and pump-hand soaps at each sink. All of our rentals include linens and towels. When you rent from us, the beds will be ready and made for your arrival with fresh, clean linens except the following: trundles, futons, sofa sleepers, top bunks of bunk beds and cots (although linens for these can be supplied upon request from you at least 7 days before your arrival). Our housekeeping staff works diligently to prepare each home in preparation for your arrival. For stays over seven nights, please inquire if you would like additional cleaning or a "Mid-Stay Cleaning". Mid-Stay cleanings are billed at $35 per-hour, per-cleaner (sometimes we send multiple cleaners to team-clean). Return furniture and electronics to original locations and operating conditions. Wash all dishes and/or start the dishwasher. Remove all food and trash from the home. Place trash in sealed plastic bags in proper receptacle(s). Appliances, counters and other surfaces wiped clean. Leave the property generally as it was found. Call the check-out line upon departure. Some Guests may chose to disregard this request if they are in a rush to depart. However, we must have prior notice if that will be the case. In that event, our cleaning staff will complete the above checklist on the Guest's behalf at a rate of $35 per hour plus a 9% Maine State Sales Tax. This will be deducted from the cleaning deposit if that was required, or charged to the credit card on file. You may be charged up to $1,000.00 additional in the event of a violation of our "no smoking", "no pet", or "maximum occupancy", policies or neglectful damages which occurred during the tenancy. Additional housekeeping charges will be applied in the event for the need of extra cleaning by our staff and the occurrence of exceeding the maximum occupancy of the cottage. We charge $35 per hour for additional cleaning above and beyond normal expected cleaning times plus one hour. We supply a departure procedure checklist in each home; these rules must be followed to avoid any additional charges. It's rare that we implement this and we hate to do it. Treat the homes or cottages as if they belonged to a good friend and you want to be invited back or they are your own home and you'll have no troubles. Our staff will arrive after your departure to thoroughly clean and inspect the Property. They have very little time to complete the 'turnover' - so your assistance in attending the above tasks is critical to their success and meeting the exceptions of the next arriving vacationing Guests at 4pm the same day. Part of the rental processing fee includes our Damage Waiver protection plan. This covers renters for up to $975 in accidental damages to the property. This is in lieu of a traditional "security deposit". If you break something at the property accidentally during your stay, just let us know right away, we'll pay for it. If something is damaged by your neglect or lack of care, you will be charged for those incidents and repairs. Even if there is accidental damages to the property - we ask that you report the accidental damages to us right away. The prevents them from being considered as "neglectful damages", so be sure to let us know right away of any issues. Some of our Property listings require a Security Deposit. if we take a security deposit, it is due 30 days before arrival and will be refunded within 30 days after departure. Sometimes the power goes out. Please either refer to the CMP (Central Maine Power) outage website which lists town by town, street by street - all current outages in the State, or call them at 1-800-696-1000. We will have no additional information, or estimated time of repair beyond what CMP shares on their outage line or website. What we do know from experience is that CMP is very quick to attend to issues in the order of magnitude. On the Water in Maine Inc. and it's Property Owners regret that they cannot be held responsible for failure of cable or Dish TV, high speed internet, or any special/unique property amenities. If an appliance breaks, there is a plumbing, heating, or cooling issue, we will make every effort to get repairs done as quickly as possible so as to inconvenience our Guests as little as possible. Reporting interruption of service or issues requiring a service technician to On the Water in Maine Inc. as soon as possible helps facilitate timely repairs. Please understand that we will make the property available to service technicians or maintenance people to remedy the situation. 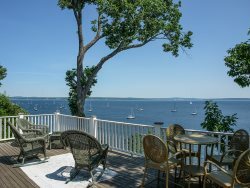 On the Water in Maine Inc. employees and the Property Owner reserve the right to enter the rental properties we offer for rent anytime to investigate disturbances, check occupancy, or provide entrance to service technicians as deemed appropriate. This is standard policy in any hotel or resort in the USA as well. 99.9% of the time, we give at least a 24 hr notice if we are planning to come to the property and only exercise this right as a last option in rare situations. Landscapers and lawn care people are permitted, through our agreement with each Property Owner, to come to the property between 10am and 4pm, Monday through Saturday, without notice, to mow the lawn, weed, tend to gardening, etc. Parking is generally limited to a set number per property with a maximum of two cars for most properties (ask us if you plan to bring more than 2 cars). Any vehicles parking on lawns or unauthorized areas could be towed. We ask that our Guests don't bring motor homes, trailers, campers, tents, kiddy pools or boats to an of our Property Owner's properties without prior permission. We understand some people want to bring a boat and then store the boat trailer at the property. If the property doesn't have space for a trailer, we'll work with you to find an acceptable storage location for your trailer at no extra charge. Talk to us about this in advance. Rentals need to be for a minimum of seven nights. (Inns, B&B's and Hotels are preferred lodging alternatives for shorter stays - for which there are many in Maine). Rental of vacation properties through On the Water in Maine do not include the use of any outbuildings, garages, attics, sheds, basements, or spaces other than the normal living spaces of the property. Although most Property Owners may give Guests access to these spaces to access trash receptacles, circuit breaker panels, or property amenity storage, they are not intended to be available for Guest storage, sleeping, parking, or work spaces. The Property Owner doesn't guarantee the working condition of any 'bonus' amenities at the property such as hot tubs, boats, saunas, deck chairs, grills, or items that are not considered an integral part of the vacation rental experience. However, if something is broken, please let us know so we can try to attend to it. Driving Directions and Access Information to our rental properties is provided 21 days prior to the rental start date and never sooner. If you don't receive them by e-mail exactly 21 days before arrival, first check your SPAM or Junk Mail folder. If they aren't there - call us right away so we can sort it out. Maine has the second highest percentage of septic system ownership in the country (septic tanks are used in place of being hooked into a city sewer system). Nearly half of all Maine homes, and 90% of all vacation homes in the state, are on a fragile septic system. 93% of our 2015 vacation homes are on a septic system. Many of these systems can be overwhelmed by heavy vacation usage, especially during the 8 busy weeks of summer. We ask of Guests renting homes that are on a septic system to please ensure that only human waste gets flushed down toilets. Guests should also ensure they do not drive on lawns as they can conceal a septic leach field. Driving over a septic field can cause upwards of $10,000 in damages. Once you arrive at your Property, please call 1-800-930-2561 Ext 5 to "check-in". Every effort is made to have each home ready by check-in time, but no guarantee is made as to the exact time occupancy can occur, except that it will be on the day the rental begins. Housekeeping and maintenance personnel must provide services between occupancies for each home in order to prepare the home for incoming Guests. Sometimes, due to unforeseen circumstances, housekeeping and/or maintenance services may not be completed by your 4pm check-in time. This situation rarely occurs, however, we apologize in advance if the is situation happens to you. In this rare occurrence, we'll call you on the cell phone number your provided at time of booking to let you know and often times will send you to the nearest restaurant for drinks on the Property Owner while the cleaning staff finishes up. If a property has a keyed lock (in replacement of no lock or an electronic key pad lock), one key is located at each property either on the kitchen table in an unlocked home, or in a lock-box. We will let you know via the automated map & directions e-mail the location of the key or keys to the property exactly 20 days before you arrive along with the map and directions to the property. Many of our homes now have electronic key pad locks. With those properties, you will be provided a temporary code rather than a key. The code will work for the duration of your stay and then be changed by our cleaning staff after you depart. With properties that have lock boxes, we suggest that during your vacation, if you leave the property, you simply return the key to lock box until you return to limit the opportunities that you may loose it. This also applies to multiple Guests at the same property requesting multiple keys. Again, we issue one key per property, so store the key in the lock box when everyone is out and the house is locked, then the first person to return can retrieve it from the lock box. For check out, please return this key to wherever you found it when you arrived. The charge for a lost key is the cost to re-key the home or for us to make copies and bring a replacement key to you at the property and this can range from $150 to $300. Color TV/DVD with basic cable service (unless otherwise noted in the Property Description), Washer/Dryer (unless otherwise noted in the Property Description), Silverware, Dishes/Cookware, Toaster/Microwave, Coffee Maker, Blender, Kitchen Utensils, Blankets, and Quilts/Shams/Pillows. A dining room table and chairs to accommodate the maximum occupancy of Guests at one setting where possible. Games - at least two decks of cards and then at least one board game. Music player (boom box or other radio device (CD player through DVD player using TV speakers)). Carbon Monoxide detectors near appliances that produce CO.
Fire Extinguishers in appropriate locations. Bed blanket or cover (such as a comforter) for each bed in the vacation rental along with appropriate pillows. One set of sheets for each bed and advertised pullout couch (with beds made) if the property has linens included with the vacation rental. If you rent linens, bed making is included with the rental fee. See Linen & Towel Rentals Section above. One bath towel for each Guest to maximum occupancy (some properties have wash clothes - some don't - per each owner's taste. If you require a wash cloth, please bring your own), if the property has towels included with the vacation rental. See Linen & Towel Rentals Section above. One cloth hand towel in each bathroom, if the property has towels included with the vacation rental. See Linen & Towel Rentals Section above. Two dish towels, if the property has towels included with the vacation rental. See Linen & Towel Rentals Section above. Food & Condiments, Baby equipment, Personal Toiletries including bar soap, shampoo, and lotions/conditioners, Beach Towels & Equipment (folding chairs), Laundry Detergent, Specialty Cooking Items, and Non-Stick Pans if quality cooking pans are important to you. Some of the properties we offer are listed on the market for sale and may be shown to prospective buyers. We will indicate this at the bottom of the "Amenity" section of the listing description of the property located on our website, or by e-mail if the Property goes on the market after you book it. Once you are in the vacation property, every attempt will be made to give 24-hours notice and to not interrupt your vacation if a potential buyer requests to view the property during your vacation. We have made every effort to ensure our advertising and property information materials are correct, however, On the Water in Maine Inc. does not own any of the properties we offer for rent and we rely upon the Property Owners to ensure they proof-read and edit their listings as well as update us on any changes in advertising to their property right away. On the Water in Maine Inc., and/or anyone working with us, is not responsible for printing errors or changes made by Property Owners in pricing, availability, furnishings, equipment or bedding arrangements. In addition, we are not responsible for anything that may or may not occur on the Property Owners' properties or in conjunction with the rentals. If there are any significant changes made to a property after a Guest books it, such as changing a queen bed to a full bed, removing an amenity such as a kayak, dock, or larger furniture item, then we will contact the Guest as soon as we are made aware of the change to let them know of the change. Otherwise, we update the property listings on our website immediately and then the Guests are responsible for checking the listings before their arrival at the property they rented to review any other updates or changes to the property. We offer about 3 of our rental properties, some not listed on our website, as year-round or extended stay rental properties. In some cases, our vacation rentals can be offered long-term as well. Our policies for renting these properties is a little different than some of those noted above. In particular, instead of a 10% processing fee, we charge a 3% application fee on the total rental amount. Additionally, a minimum $800 security deposit is required. Lodging Tax of 9% must be charged unless the purpose of your stay is for educational purposes (such as you are taking a course at the Maine Media Workshops on photography in Rockport), work (such as you are a traveling nurse and you have been sent here for a month to do insurance evaluations), or the property will become your primary residence (such as you are moving to Maine and need to rent a furnished house for a few months while waiting to move into your new house), then you may be subject to exemption from the lodging tax. To become exempt in one of these situations, both you and On the Water in Maine will need to complete the "AFFIDAVIT OF EXEMPTION FOR 28 DAY CONTINUOUS RENTAL AT A HOTEL, ROOMING HOUSE, TOURIST, OR TRAILER CAMP". You can print off and complete that exemption request by clicking HERE.